The Outer Veil Sector Map is a full colour, high resolution, A1 size, complete map of the entire area of space of the Outer Veil setting. The map includes travel and communications routes, area boundaries and much more! Requires the use of the Outer Veil book from Spica Publishing and the Traveller Core Rulebook, available from Mongoose Publishing. Please note that this map is A1 size and is therefore very big to print out. You can purchase Outer Veil Sector Map as a PDF to download from Spica Publishing’s page at DriveThruRPG.com. Outer Veil Sector Map is not available to buy in print. 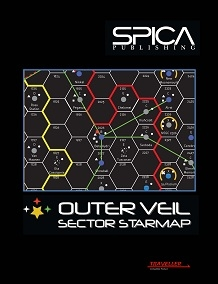 Outer Veil Sector Map © Spica Publishing 2011-2015. All rights reserved.